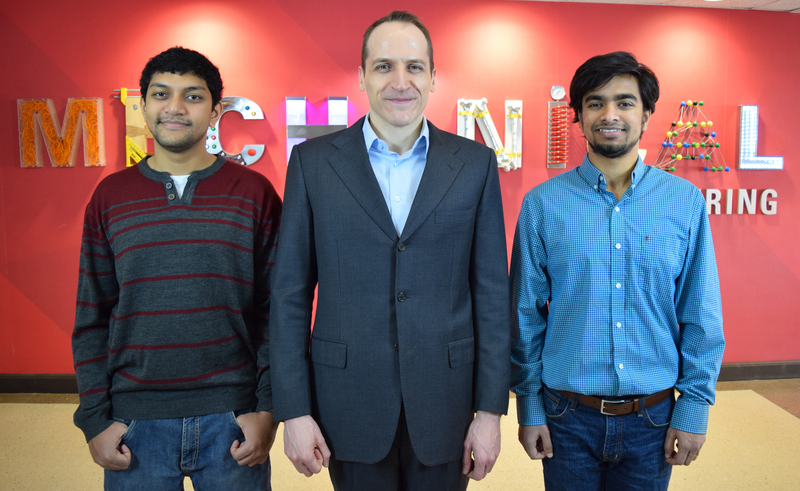 From left: Fahad Chowdhury, Ph.D. candidate in chemical and biological engineering at the University Ottawa; Alberto Passalacqua, associate professor of mechanical engineering at Iowa State University; and Manjil Ray, Ph.D. student in mechanical engineering at Iowa State. A group of researchers from Iowa State University and the University of Ottawa in Canada have teamed up on a research project that will examine electrostatic charging of particles made of insulating materials such as plastic in fluidized bed reactors. Findings from this research can be applied to the industrial systems such as the production of plastic bottles, boxes, car interiors and more. The researchers will develop mathematical formulas to better understand these systems. “Fluidized bed reactors are a type of chemical reactor where solid particles are mixed by a relatively strong flow of a gas. During this motion, particles collide with the reactor walls, and also among each other. These impacts cause the particles to become electrostatically charged. Electrostatic charge causes a similar phenomenon to what we observe when we rub a plastic pen on a wool cloth and then attract small pieces of paper. In fluidized beds with insulating particles this effect can become so strong that particles stick to the reactor walls,” said Alberto Passalacqua, an associate professor of mechanical engineering who is leading the project. The chemical reaction in the system produces heat, which cannot leave the system because the wall is covered by particles. These particles then melt and form thick layers. These layers can detach and occlude the reactor, leading to significant maintenance costs. Passalacqua has teamed up with Poupak Mehrani, a professor of chemical and biological engineering at the University of Ottawa (UO); Andrew Sowinski, an assistant professor of chemical and biological engineering at UO; Fahad Chowdhury, a Ph.D. candidate in chemical and biological engineering at UO; and Manjil Ray, a Ph.D. student in mechanical engineering at Iowa State, on this project. Chowdhury works under the supervision of Mehrani, who has conducted research focused on solids electrostatic charging, in particular in fluidized, beds for the past 12 years. However, little research has been done in regard to modeling these phenomena with predictive computational tools. 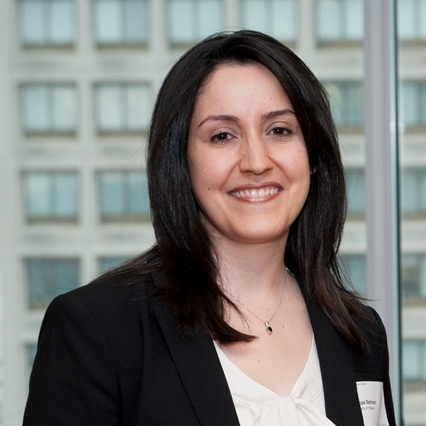 “This motivated the collaboration between my group at Iowa State University and the University of Ottawa, so that we can share information and work together to formulate a predictive model that can be used to study these phenomena in industrial systems, reducing the cost of experimental work,” said Passalacqua. Mehrani described this current research as a “groundbreaking step” in their field. Passalacqua, whose research group focuses on computational modeling of multiphase flows with particles, bubbles and droplets, and his team develop models and software tools to simulate the behavior of these flows. He said that these contributions complement the work of Mehrani and her team, which contributes to the research in their field more broadly. With support from University of Ottawa and the Mitacs Globalink Research Award (a Canadian Funding Organization), Chowdhury is able spend three months in Ames working directly with Passalacqua on the project. Chowdhury holds undergraduate degrees in chemical engineering and computing technology as well as a masters in chemical engineering from UO. He said his goal on this project is to work more closely with Passalacqua and Ray on the modeling side of the research. “My expertise in computational fluid dynamics is very limited, and I wanted to take this opportunity to learn more about it while also helping in the code implementation for our current model,” he said. This research experience at Iowa State is building upon his past research at UO where he and his colleagues perform fluidization experiments using a pilot-scale fluidized bed to observe the charging behaviors of insulative powders at varying operating conditions. He has also been designing bench-scale experiments to better understand the fundamentals of charge transfer due to particle-particle and particle-wall collisions. By performing such experiments, he and his colleagues can provide insight to help develop more realistic simulation models. Chowdhury, who has lived in Saudi Arabia, the United States, and Canada, said he has enjoyed his time on Iowa State’s campus since arriving in September. Fellow graduate student Manjil Ray brings his own set of expertise to the project. Ray holds an undergraduate degree in mechanical engineering from the Institute of Technology, Kharagpur and worked for the Indian Space Research Organization before coming to Iowa State in the fall of 2014. Ray added that his research utilizes knowledge he’s learned in the ME curriculum such as fluid mechanics and conservation laws. The findings of this research can be applied to industries in Iowa (as well as Canada and other parts of the world), advancing Iowa State’s mission as a land-grant university. Specifically, this research can be applied to systems where particles can accumulate charge due to impact, leading to operational difficulties and safety hazards. The collaboration for this particular project started in 2015 and will continue through the time Chowdhury and Ray graduate around 2020.